I was in Chicago for a few days so I decided to head over to the The Chicago Diner for lunch. I first dined here a few years ago. I had arrived incredibly excited to finally have the chance to eat at this super-hyped restaurant only to be disappointed to find that it was just comfort food. There isn't anything wrong with that -- I just thought they had more-gourmet offerings. Now that I can take it for what it is, this time I enjoyed it more. The small diner was pretty crowded for a Wednesday afternoon. There isn't much of a waiting area when you arrive so if you need to wait for a table, you usually do so outside the door to the main dining room. In the summer, they also offer outside seating in the back. The decor is 50's diner style with red diner tables and classic diner chairs. After hemming and hawing over the menu choices, I finally placed my order. I started with an Izze and a small bowl of the macaroni and cheeze. The last time I came here, I didn't care for the macaroni and cheeze, but everyone raves about so I gave it another try. It is basically just noodles with Daiya vegan cheese. I thought it was okay, but certainly not exceptional and nothing special. Nothing really compares with the mac 'n cheese at Soul Vegetarian's Exodus in DC, but that is for another post. Another patron actually turned around and asked if that was the best mac 'n cheese I'd ever had and I politely told him that it wasn't and told him about Soul Veg. Come to find out that the couple also travels and eats out at vegan restaurants so we engaged in an interesting discussion. I was there by myself so I didn't mind at all. Based upon my waitress' recommendation, I ordered the Titanic BLT Burger. I half knew that this was not going to be a good idea, but I wanted to try it anyway. I also ordered some ginger garlic flashed greens on the side. This burger was humongous. The seitan patty was made with corn, peppers, and onions and it was topped with Uptons Naturals bacon, cheeze, French-fried onions, lettuce, tomato, and vegan BBQ mayo. When I finally put the top on the burger, I couldn't get it into my mouth -- it was that big. I should have taken this as a sign and not have eaten the whole thing, but I did anyway and paid for it dearly. 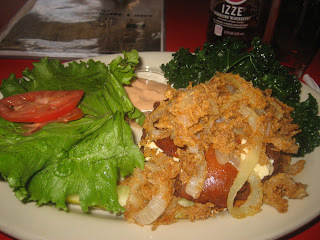 I liked the seitan burger, but it was just way too big. It all went together well -- even the onion rings. The only thing I didn't really care for was the Uptons Naturals bacon. While it is more like bacon than the tempeh bacon I usually eat, I found it to be rubbery and hard. Next time, I'd prefer not to have the bacon. The ginger garlic kale that I had on the side was fantastic. It was cooked and seasoned perfectly. As a side note, I am really glad that my waitress asked if I wanted vegan cheese when I requested cheese on my burger. I keep forgetting that they are a vegetarian restaurant and that they serve milk products. When I asked my waitress why they don't just go vegan she said that if it was up to her, they would, but the reason they aren't is because they'd lose a lot of their regular patrons. She said the breakfast is popular and they serve a lot of eggs and cheese. That is a shame. But, oh well. Chicago Diner is a great place to go for lunch, but it is easy to eat too much there. After my meal, I actually went into a full-on food coma from eating that entire burger. I actually had to take a nap and felt almost sick -- not from the food, but from eating too much. All in all, the service was great, the prices were reasonable at only $10 per entree, and the food was good comfort food. Although I didn't order dessert during this meal, they are very well-known for their desserts and if you can make room, I'd recommend you try them. This is a great spot to hit for a quick lunch.